Wishing you could get back to sewing your own clothes again? Let's try it out together. Many of us learned to sew our own clothing as young girls but left that skill behind when we got busy with life. Perhaps you are one of those people or perhaps you have never developed the skill but do have the desire. I’ve been sewing garments for girls for my upcoming Artful Sewing Course and now I’m sewing for myself. It’s so much fun! I thought, “why not share the fun with you?” I decided to offer a Free Mini Course as you are waiting for me to open up enrollment. This is the summer top that I made, with clear instructions on how to read, resize, cut out and sew a dress pattern. 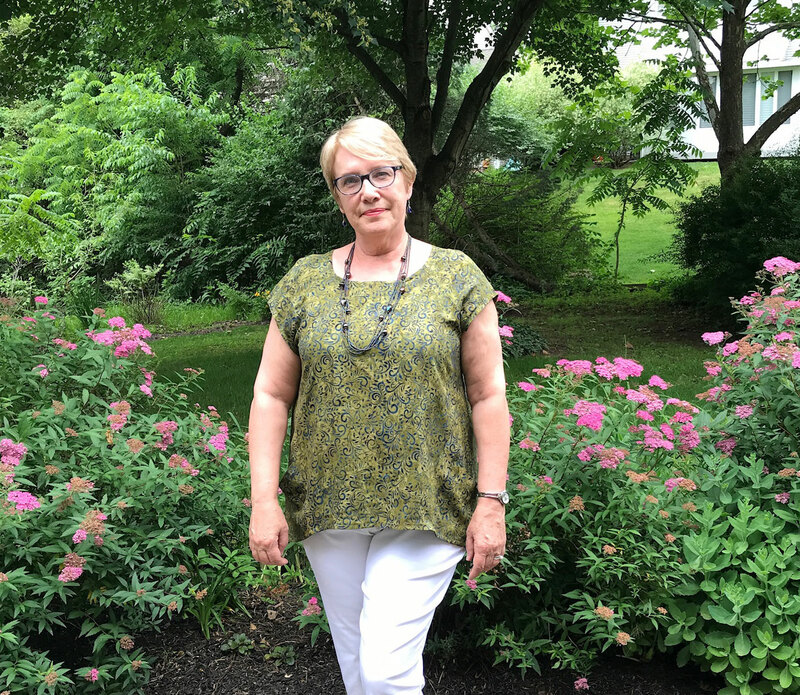 I used McCall’s M7093. I saw another quilting friend post this pattern on Facebook showing a top she had made for herself. It looked flattering for many different body types. 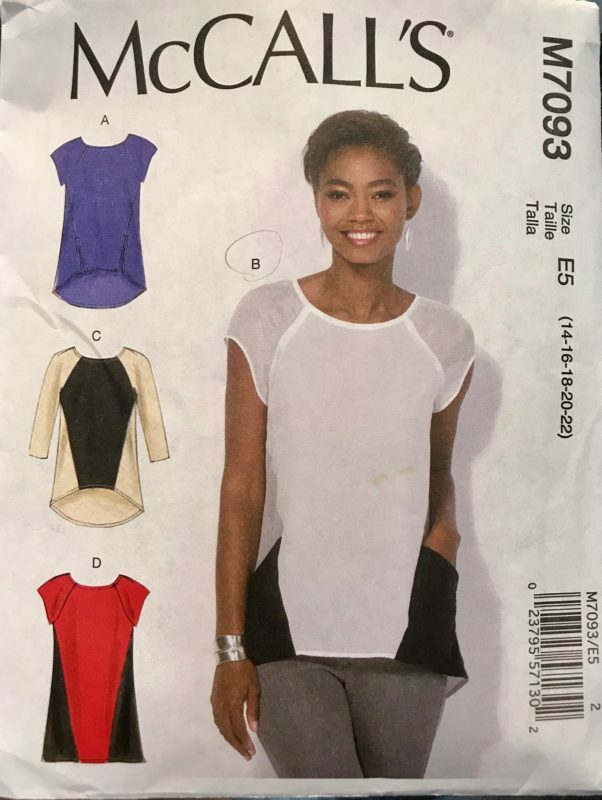 I made view B but all in one fabric with no color blocking. The hem of the garment has a high/low feature so it is normal length in the front and lower in the back for more coverage. This also has pockets which I included but certainly can be left off if you wish. Now just let me say here, I had to swallow a lot of pride when producing this video and taking these photos. I am not the size I wish to be but I know I am in good company, right? That’s the whole point of sewing for your self! You get not only the size you want but the proportions that fit your height. I am short, pear shaped and the arm holes on store bought garments almost always gape on me. No, I do not want to show off glimpses of my bra to the general public. 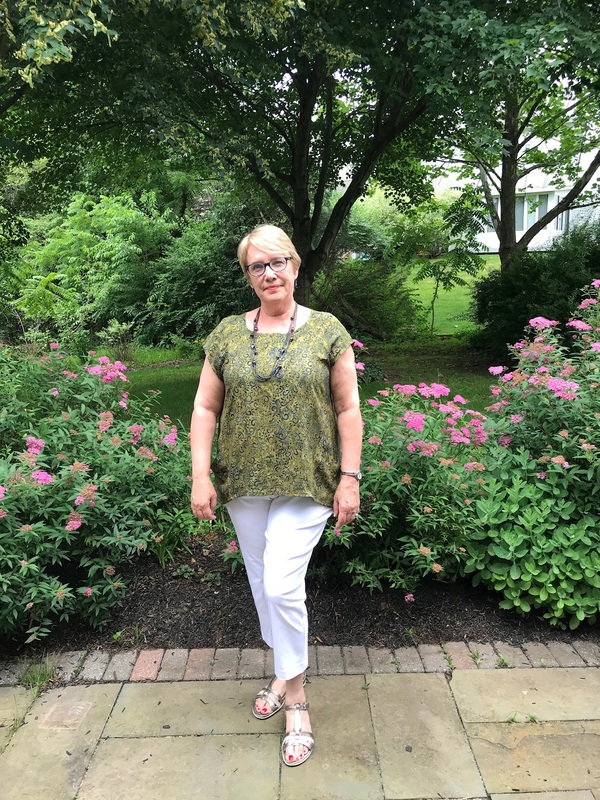 I bring store bought garments home and always take in the under arm seams, shorten sleeves, and shorten hems. The other great thing about sewing garments from start to finish is the fun of shopping for fabric. Maybe you love a garment but can’t stand the polyester fabric. 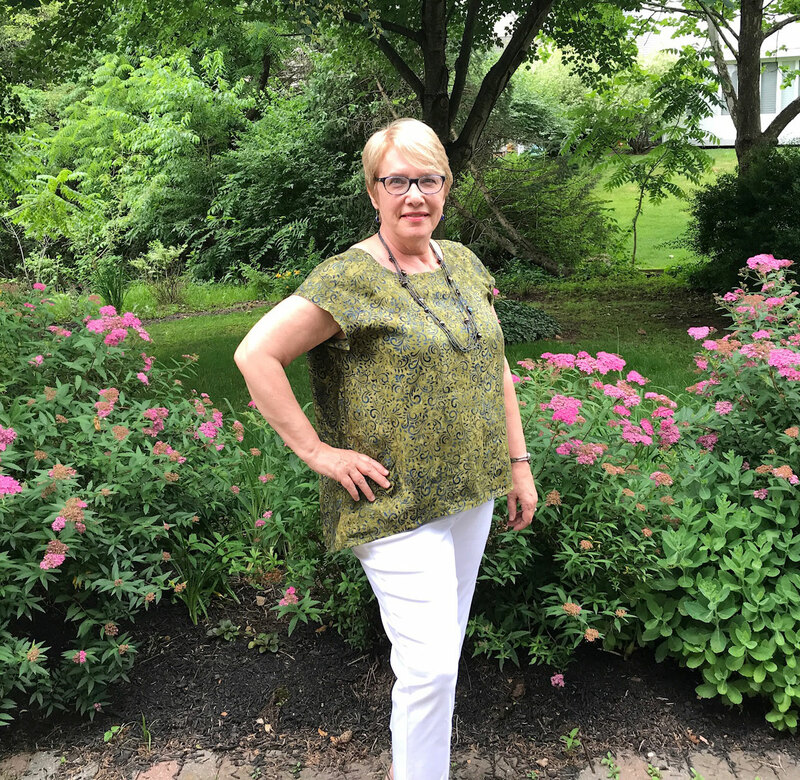 Well, it’s not hard to find a pattern and sew it up in your favorite linen or rayon or cotton. I’ve seen beautiful fabrics in local stores and online, both. Feel free to ask if you need help pairing fabrics and patterns. 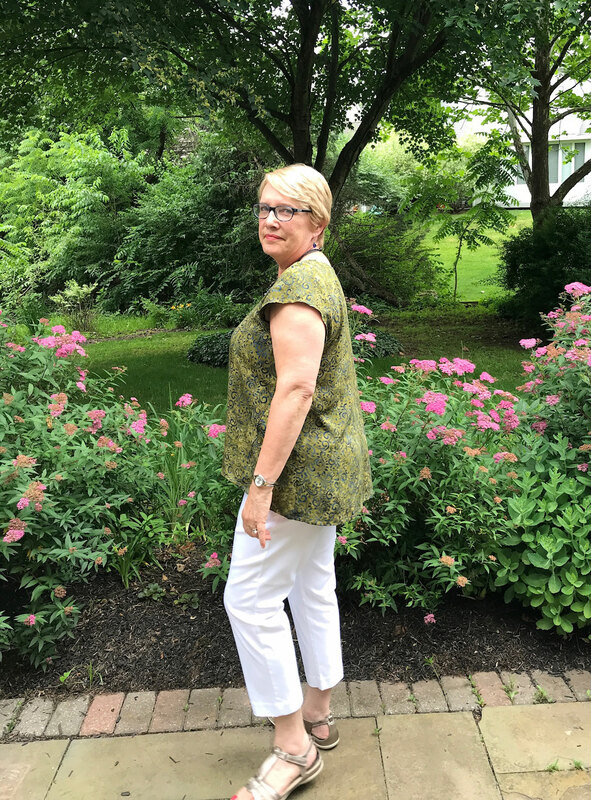 In this video, you will see me demonstrate how to shorten or lengthen a garment to your measurements. You will also see me grade from one size to another. This is another wonderful thing about patterns with multiple sizes. Links to pattern and fabric are below the video. One thing I should mention here, as much as I love this rayon, it did wrinkle a lot. It would not be a good choice for travel garment unless you don’t mind ironing. The drape was lovely and it was also a nice weight. Ready to try it out? Find the video and links here. Show me your finished photos! You can post them on our Artful Quilting and Sewing Facebook Page. I can’t wait so see what you make! If you’d like to be notified when we open up enrollment for classes you may do so here. You’ll get a free wristlet clutch tutorial as an extra bonus!